On June 2, 2014, the Environmental Protection Agency (EPA) issued a proposed new rule pursuant to section 111(d) of the Clean Air Act (CAA) that would establish state-by-state carbon dioxide (CO2) emission reduction goals for existing fossil fueled electric generating units (EGUs). Under the proposed rule, EPA would require states to meet CO2 emission “goals” or targets starting in 2020 on a state-wide basis. States could allow their power plants to use a number of measures to meet those goals, including heat rate improvements, energy efficiency, plant retirements, and renewable energy. EPA projects that the Proposed Rule will result in power sector emission reductions of 30 percent from 2005 levels by the year 2030. On the same date, EPA issued a proposed rule for modified and reconstructed EGUs under section 111(b). This alert will focus exclusively on the Proposed Rule for existing sources (referred to in this alert as the “Proposed Rule”). Section 111(d) directs EPA to promulgate regulations establishing a federal-state process for setting standards of performance limiting emissions from existing sources for pollutants not otherwise regulated in other specified sections of the CAA. Under this process, EPA develops performance standards, states are to submit plans to EPA to meet these standards, and EPA then approves or disapproves the state plans. EPA has used this section in only a handful of rules over the forty-plus year history of section 111, and there is almost no case law interpreting EPA’s authorities under section 111. In the previous rules under section 111(d), EPA has issued a “guideline document” that set out emission reduction targets and compliance deadlines for states, and has required states to implement compliance plans that ensure that the regulated sources meet those targets. The Proposed Rule includes such a guideline, along with a requirement that states submit plans to achieve compliance with the guideline. EPA has proposed to set a series of “state-specific emission rate-based CO2 goals” that would require states to reduce statewide emissions from the power sector. EPA has proposed to set an Interim Goal for 2020-2029 and a Final Goal for 2030 and beyond. EPA projects that, averaged nationally, these goals would result in a 20 percent reduction of CO2 from 2005 levels from existing fossil fuel power plants over the 2020-2029 period, and a reduction of 30 percent by 2030. EPA justifies setting state-by-state goals, instead of uniform reduction targets, by citing the “unique mix of emissions and power sources” in each state. EPA’s proposed Interim (2020-2029) Goals range from 244 lbs. of CO2/MWh for Idaho to 1882 lbs. CO2/MWh for Montana. The proposed Final Goals range from 215 lbs. CO2/MWh for Washington to 1783 lbs. CO2/MWh for North Dakota. Form of State Goal. Each state goal would take the form of an average rate of emissions per net MWh of electricity (lbs. CO2 / MWh) across all power plants within the particular state. However, in the proposed rule EPA gives states the flexibility to convert the rate-based goal into a mass-based goal. 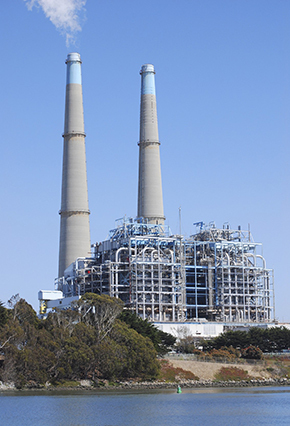 This could allow a state to set a cap on emissions from its power sector. This flexibility is responsive to the comments of some states that had requested a mass-based system, and could be necessary to integrate existing cap-and-trade programs already implemented by California and a collection of Northeastern states with the proposed rule’s framework. EPA then applied these BSER “building blocks” to each state’s existing and projected coal, natural gas, and zero-carbon power systems (including both renewable energy and nuclear generation) to determine its state-specific emission rate goals. Notably, three of these four building blocks for setting each state’s target are based on “beyond-the-unit” (or “outside-the-fence”) measures for reducing or avoiding CO2 emissions. EPA has proposed to provide states with flexibility in meeting their emission targets. The proposed rule offers states at least three forms of flexibility: flexibility in the means of compliance, flexibility in timing, and flexibility in the form of the compliance obligation. In addition, EPA proposes to approve plans that employ a “portfolio approach” in which entities that are not EGUs would be partially responsible for meeting the state emission target. Means of compliance. The proposed rule would allow states to comply using any of the four “building blocks” EPA considered in setting the state-by-state emission guidelines, as well as other emission reduction measures not considered by EPA. These measures could include both “at-the-unit” measures such as improving boiler efficiency or switching to cleaner-burning fossil fuels (such as natural gas) and “beyond-the-unit” measures such as promoting demand-side energy efficiency or conservation, increasing the deployment of renewables, or establishing a cap-and-trade program Importantly, the proposed rule would allow pre-existing state programs, as well as new programs implemented ahead of the deadline for compliance, to be counted toward compliance with the state goal. EPA, working with other federal agencies and states, has set up a website with technical resources for use in developing state plans. Compliance timing. Regardless of what measures they use for compliance, state plans must ensure that the state’s power sector meets a specified interim carbon intensity target, on average, over the 2020-2029 period, and a more stringent target by 2030. However, EPA proposes to allow states to determine when and how quickly individual power plants in the state must reduce their emissions. Form of the compliance obligation. Although the proposed rule is formulated as an output-weighted average rate-based target, EPA proposes to allow states to convert their rate-based target into an annual tonnage emissions budget (also known as a “mass-based” target). In addition, the proposed rule would allow multiple states to work together to achieve reductions—an option that could encourage states to join existing state cap-and-trade programs or create new multi-state programs. States that decide to participate in a multi-state compliance program could submit a single unified multi-state plan in lieu of their individual state plans. Compliance via a “Portfolio” Approach. In addition to approving state plans that place the ultimate compliance obligation directly and solely on EGUs with the state, EPA proposes to also approve state plans that employ a so-called “portfolio approach.” EPA describes the portfolio approach as a plan that includes “emission limits for affected EGUs along with other enforceable measures, such as [renewable energy] and demand-side [energy efficiency] measures, that reduce CO2 emissions.” Thus, state plans could impose obligations on EGUs as well as other entities that otherwise would not be regulated under section 111(d). Under the proposed rule, obligations on these non-EGU entities would still be federally enforceable through incorporation into the federally approved state plan. EPA explains that in order for EPA to approve a portfolio-based state plan, however, the agency would have to determine that the combination of measures could achieve the state-specific emission target. In addition, such a plan may need to contain “backstops” to ensure compliance with the mandated emission rate. Comments and Public Hearings. EPA indicates that comments must be received within 120 days of the proposed rule’s publication to the Federal Register. Depending on the exact date of publication, this means comments will be due to EPA sometime in early October 2014. EPA is also scheduling four public hearings to discuss the proposed rule in late July. Finalization of the Guideline and Submission of State Plans. EPA indicates that it expects to issue a final rule by June of 2015. EPA proposes to require that each state submit its plan by June 30, 2016. If a state needs additional time and provides proper notification and explanation, EPA proposes to grant a one-year extension (until June 30, 2017) for submittal of individual state plans, or a two-year extension (until June 30, 2018) for multi-state plans. To qualify for these extensions, states would be required to submit detailed explanations by April 1, 2016 that contain specified information, including the likely approach the state will take with its state plan, the level of emissions the state plan could achieve, and an explanation of the expected path to completion of the state plan. According to EPA, the Proposed Rule could lead to $7.3 billion in compliance costs by 2030. EPA also predicts that the Proposed Rule will spur states and regions to consider new or expanded emission reduction, energy efficiency, and renewable energy policies. As a result, EPA’s proposal will have major implications for states, electric utilities, natural gas and coal suppliers, renewable energy and nuclear energy generators, energy efficiency companies and aggregators, financial institutions, and others. Van Ness Feldman will be preparing a comprehensive analysis of the proposal that will be available on a cost-share basis. Our professionals are also available to provide counsel to companies and others as they assess the implications of the rule and prepare to submit comments to EPA. Please contact Kyle Danish, Stephen Fotis, or any other professionals in Van Ness Feldman’s Environmental Practice for additional information on the analysis or on other matters related to this rulemaking.